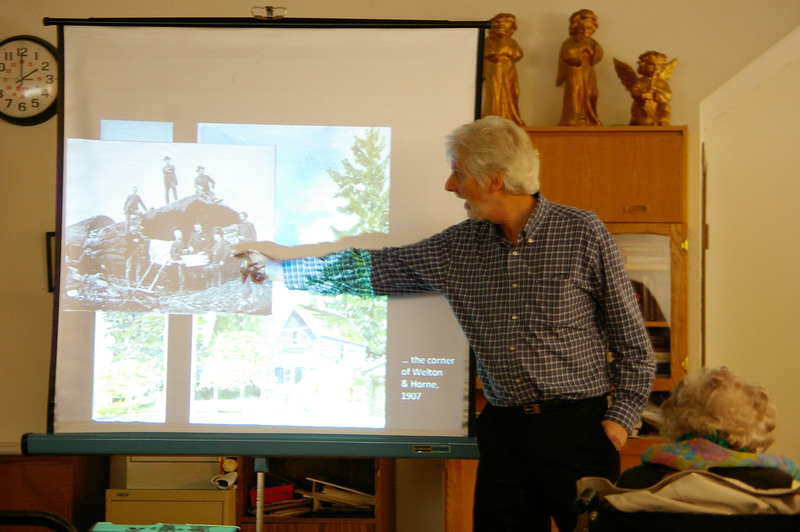 Artist and author Michael Kluckner explains the architectural changes in old and new Vancouver in a presentation for the Marpole Historical Society on March 9, 2013. A plethora of collective “ahs” filled St. Augustine’s Parish Hall last Saturday, when Michael Kluckner, an expert on Vancouver history, showed slides of the former White Spot on Granville and 67th Ave. 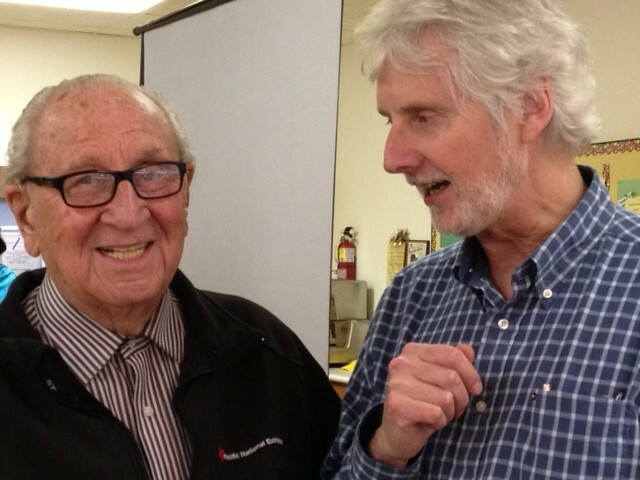 Most of the nearly 100 seniors who attended Kluckner’s presentation about old and new South Vancouver, spent a big chunk of their spare time and money at one of the city’s top social centres of the era. As reported earlier on this blog, Kluckner’s presentation dealt with lost Vancouver architecture and lifestyle and his view on the future of the city. Kluckner grew up in Kerrisdale in the 1950s and 60s and lived in Vancouver for most of his life, except for a short stint in Australia. 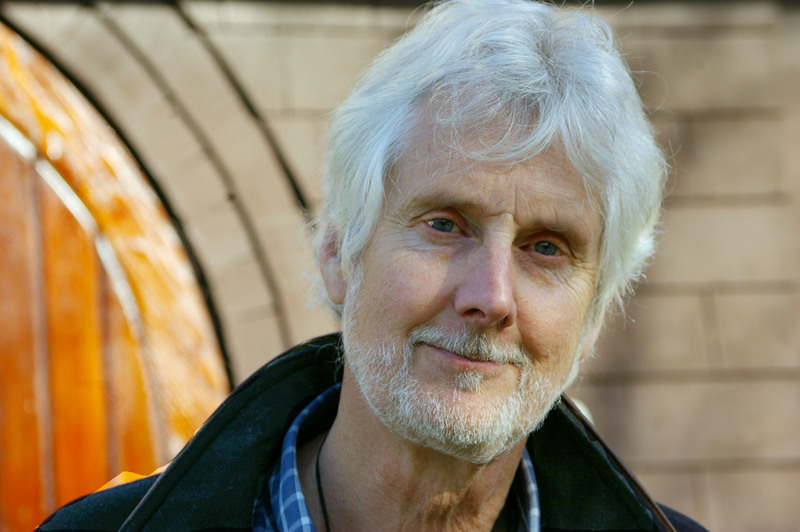 He wrote several books about the city, including Vanishing Vancouver and Vanishing Vancouver, the last 25 years, which was published in 2012. Kluckner charmed his audience with a PowerPoint presentation of his own watercolour paintings of heritage houses, archive photographs and vintage cartoons. 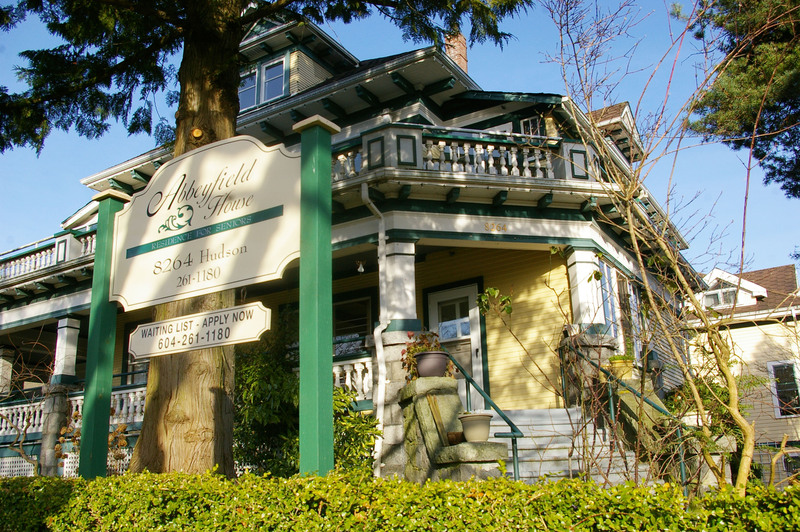 Abbeyfield House on 8264 Hudson Street in Marpole used to be Vancouver’s first children’s hospital. The heritage house is now a seniors’ residence. For Kluckner, “affordable housing” is oxymoron. He said building is always expensive, whereas maintaining an existing house is more affordable. The audience chuckled when Klucker said that in the 1960s, prices of $20,000 for a house made alarm bells ring: “Only 40 per cent of society can afford to buy a house today,” read newspaper headlines of the time. Musican Dal Richards came to congratulate Kluckner on this “terrific” presentation. After the presentation, Kluckner was greeted by musician Dal Richards, who remarked he was born right next door to the Colbourne House, home of the Marpole Museum & Historical Society, 95 years ago. Richards, famous for his legendary concerts on the roof of the old Hotel Vancouver, now lives in Crosstown, the area between Yaletown and Gastown. June Olson was born and raised in Marpole. 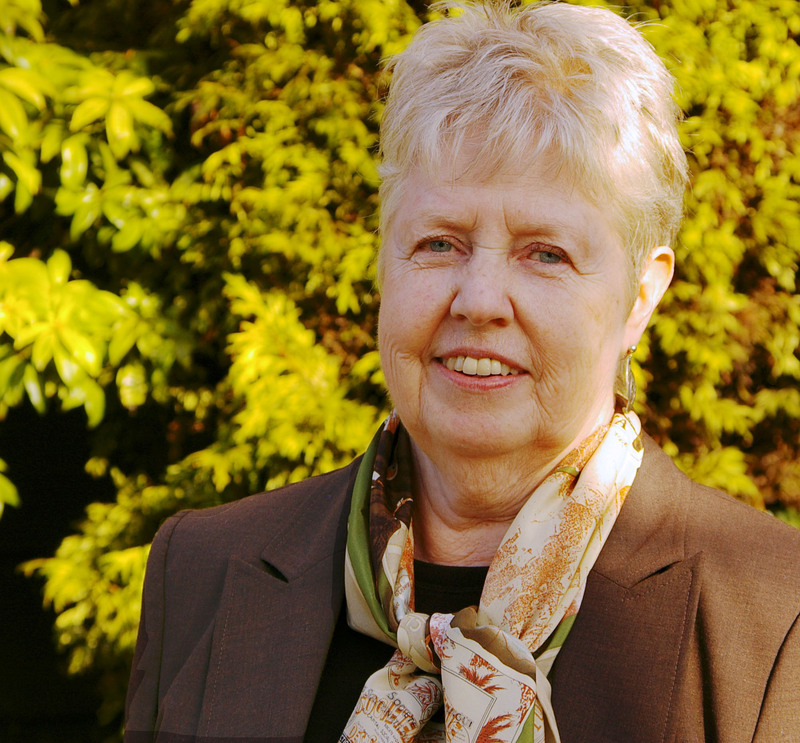 June Olson, who was born and raised in Marpole and returned to live here after spending many years in Edmonton, chuckled when she remembered being interviewed by UBC students in the 1970s. When they asked her about the rising costs of living, she remembers laughing away their concern. “Oh yes, I will always be able to afford this place,” she said, somewhat naively, as she put it. Olson said she is fortunate to still have her mother’s 1930s house, where she moved into after her mother moved into a Marpole seniors’ home. Olson said she agreed with Kluckner that increasing density is the biggest challenge for the area. The next event by the Marpole Historical Society will take place on May 25. Incidentally, Kerrisdale author Caroline Adderson, who curates images of heritage houses on her facebook page Vancouver Vanishes, was profiled in an article in the Globe and Mail on March 8. This entry was posted in Marpole, Real Estate and tagged Abbeyfield House, Caroline Adderson, Colbourne House, Dal Richards, heritage houses, June Olson, Katja De Bock, Marpole, Marpole Historical Society, Michael Kluckner, Vancouver Vanishes, Vanishing Vancouver by westsidebeat. Bookmark the permalink.